For some years the main holder of Lanchester information worldwide has been Coventry University’s Lanchester Library, sited in the iconic Frederick Lanchester Building, postcode CV1 5DD. It is here that you’ll find the dramatic and fascinating Lanchester Interactive Archive. Coventry University presents the Lanchester Trust’s annual Student Prize and is creating Masters degrees based on Lanchester’s aeronautical theories. The Library’s impressive Lanchester collection includes photos, correspondence, notebooks, sketch books, patents, blueprints, hardback books, magazines, press cuttings, audio and visual discs, and so much more. Many of these items and artefacts have been donated by myself, members of the Lanchester family, and others. The continual hunt for Lanchester information received a special boost last year. The Heritage Lotteries Fund recognised the University’s desire to make the general public more aware of the profound work of Frederick Lanchester, along with his younger brothers, Frank and George. HLF’s generous three-year support has allowed most of the Lanchester Collection to be conserved and digitised by The National Archive. The results allow, for example, easy access to thousands of copies of original documents from the 1890s. Some of these were originally written by Lanchester in pencil and therefore easily smudged. HLF funding has also allowed for a large, permanent display room to be created within the Lanchester Library. This is a place of fun and learning about Lanchester, for children and adults alike. Plans are already in place to arrange visits from student groups from primary through to university ages, while adult groups with varying interests will be welcomed. Come and See Us Whenever You Want! Individuals can attend unannounced, as the Lanchester Interactive Archive is usually ready to welcome you. The impressive project employs an Archivist and two part-time Outreach Officers to spread the Lanchester gospel far and wide. Amongst many other initiatives, Frederick Lanchester’s profound work on ‘heavier-than-air’ flight is highlighted. His ‘flying machine’ designs are faithfully reproduced in model form to enlighten visitors. One of the enterprising activities has been the building of a Lanchester car, from the bumper back to the rear window. Visitors are encouraged to sit in the car and try out the switches and steering. Eventually it is hoped that funds can be raised to allow visitors to see how car engines work, as they will show components moving in linear and rotary movement and with different gears in action. The Lanchester Interactive Archive will present its annual Open Days on Saturday 2nd and Sunday 3rd June 2018, to coincide with the car Rally outside the Lanchester Library (see the LIA Coventry Rally page). 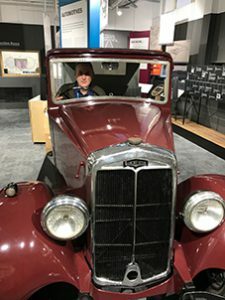 When you visit, the first thing to surprise you at the LIA will be the 1933 Lanchester car prominently displayed; how did it squeeze in through that single door? It’s there for your family to sit in, work the switches and be photographed. From the old then to the new… and it doesn’t get much newer. Multiple, large computer screens are there to bring alive Lanchester’s designs and inventions. Play the educational Lanchester games: flying round Fred’s workshop, or driving either a 1902 or a 1932 car over an obstacle course, or designing your own Lanchester car, or many other challenges. These are all at different levels to cater for everyone from 5 to 95-years-old. Elsewhere, see the Lanchester car seem to zoom out of the screen to drive up the Crystal Palace steps, or the Lanchester racer lap Brooklands, and much more. You do it … you hold aloft the steering wheel with its in-built computer to help you delve into the formidable Lanchester archives… interactive this surely is. The Lanchester time-line spreads along one wall, while the picture gallery takes you on a visual journey through the ages. The exhibition houses tens of thousands of Lanchester documents and books to home in on, although this serious research may be more suitable for a quieter day. To create the next phase of the Lanchester Interactive Archive and its display worthy of Lanchester, it is hoped that enthusiasts and the public will wish to donate Lanchester artefacts, photos, documents etc to the LIA. Most urgently needed are chrome-plated side, head and spot lamps, a chrome front bumper, 1932 chrome handbrake, and shock absorbers. Any worthless engine and gearbox will also be gratefully received as more internal components can be made visible – this ‘car’ really isn’t going anywhere! For more information about this great Lanchester project that we can all share and enjoy, please contact Chris Clark, Lanchester Historian (and volunteer at Coventry University since 1983).